Source: CICH graphic created using data adapted from the National Longitudinal Survey of Children and Youth, Cycles 3 (1998-1999) through 7 (2006-2007). http://www.dpe-agje-ecd-elcc.ca/eng/ecd/well-being/longdesc/figure6-eng.shtml – accessed May 22, 2017. Additional information on the prevalence of diagnosed asthma for children under 6 years of age in urban and rural areas can be found in the Health Outcome section of the Early Child Development Module. 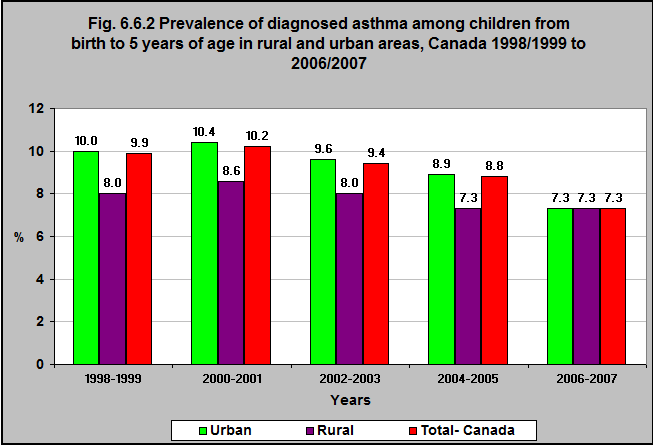 In 1998/99, children under 6 who lived in rural areas were somewhat less likely to have been diagnosed with asthma (8%) than those living in urban areas (10%). In 2006/07 these proportions were the same – at 7.3%. Children are exposed to a number environmental toxins in indoor and outdoor air – environmental tobacco smoke, mould, smog (made up of ground-level ozone and fine particulate matter). These have been associated with asthma.